Industrial chain sprocket breakages can bring your machinery to a grinding halt. Many machines can’t operate without their drive train sprockets, and replacing them can cost a lot of time and money. Additionally, the performance of a conveyor or drive depends on sprocket-chain interaction. Using the right sprocket is just as important as choosing the right chain. At USA Roller Chain, we offer a wide selection of standard roller chain sprockets at unbeatable prices. Our sprockets are engineered to perform well under pressure and are long lasting. The roller chain sprockets for sale in our store include single-strand roller chain sprockets, double strand sprockets and multi-strand roller chain sprockets. Furthermore, our drive chain sprockets meet both ANSI and ASME standards. We’re positive you’ll be happy when you buy industrial chain sprockets in our store, because they’ll last you a long time. If you’re not sure what sprockets are the ones you need for your machine, please don’t hesitate to give us a call. Our knowledgeable staff, superior products, and unbeatable prices are the reasons for our A+ BBB rating! To figure out what size or type of sprocket you have simply refer to the above illustrations and fill out the below form. Then click the "submit" button at the end to send it to our customer service team and expect a response back. If you are having trouble identifying your roller chain please contact us and we will be happy to assist you. There are six different standard styles of sprockets for single strand roller chain. A-plate sprockets are manufactured with no-hub and are supplied with just a singular hole in the center. Depending on the sprocket size this hole can vary in diameter. we can supply these sprockets with the standard stock-hole or with a custom bore from our in-house machine shop. B-hub sprockets are manufactured with a hub on one side. These sprockets are supplied with a stock bore or with a pre-bored finished bore that includes a key-way or 2-set screws. We stock a wide range of bore sizes for standard shaft diameters but if a non-standard or specialty bore is required we can supply that as well. C-hub sprockets are designed with a hub on both sides. This style standards comes with a plain hole stock bore, but if a custom diameter bore is required we can supply that as well. Taper bushed sprockets are manufactured with a large inside diameter hole to accommodate the required taper-lock bushing. These sprockets are commonly used because they are easy to change out, and the range of stock bore sizes with taper lock bushings is far greater than that of the sprocket it's self. We stock a complete line of taper bushed sprockets and taper lock bushings for immediate delivery. If you need help pairing a specific taper-bushed sprocket with the right bushing please give us a call and we will match them for you. QD bushed sprockets (also commonly known as quick detachable sprockets) are designed to quickly detach from the shaft. Typically the sprocket will wear out quicker than the bushing, so replacing only the QD bushed sprocket plate is typically cheaper than having to replace a complete sprocket assembly. additionally, the range of stock bore sizes with QD bushing is far greater than that of the sprocket it's self. We stock a complete line of QD bushed sprockets and QD-Bushings for immediate delivery. If you need help pairing a specific QD bushing sprocket with the right bushing please give us a call and we will match them for you. Weld on sprockets are a 2-piece construction sprocket consisting of a plate and a separate hub to weld onto the plate. These sprockets are common in applications that require specialty reduced-hub sprockets such as packaging facilities, and agricultural applications. They are also common because there is a wide range of weld-on hubs such as round bore, hex bore, square bore, and splined bore. Many people keep these types of sprockets on-hand because thy are economical and quick to assemble. For Multi-Strand roller chain sprockets there are four different standard styles. B-hub multi strand sprockets are manufactured with a hub on one side, and are supplied with a stock bore or with a pre-bored finished bore that includes a key-way or 2-set screws. We stock a wide range of bore sizes for standard shaft diameters but if a non-standard or specialty bore is required we can supply that as well. Multi strand C-hub sprockets are typically a standard with large tooth counts as well as large chain sizes (#140, #160, #180, #200, #240, etc..). This is because they will provide the ultimate stability and offer the strengths needed in high-strength applications. C-hub sprockets are designed with a hub on both sides. This style standards comes with a plain hole stock bore, but if a custom diameter bore is required we can supply that as well. When it comes to taper bushed sprockets for multi strand roller chains there are ATB, BTB, and CTB styles to accommodate the correct bushing type and strength needed. This style of sprocket is commonly used because it is easy to change out, and the range of stock bore sizes with taper lock bushings is far greater than that of the sprocket it's self. We stock a complete line of taper bushed sprockets and taper lock bushings for immediate delivery. If you need help pairing a specific taper-bushed sprocket with the right bushing please give us a call and we will match them for you. Split style roller chain sprockets are a special item that we make in-house. These sprockets are especially essential in applications that removal of the sprocket by sliding it off the shaft is impossible and or extremely difficult. Double pitch sprockets are a requirement for all double-pitch series roller chains. They are manufactured with a special tooth-profile to allow proper and complete seating of the rollers on double pitch roller chains. There are few circumstances where you can use a standard roller chain sprocket with double pitch chain. This can occur with large odd numbered tooth-count sprockets, and if you are using a double pitch chain with a D-5 attachment, such as citrus chain (C2060H With D-5 Every 2nd). We stock a complete line of double pitch sprockets. Stainless steel sprockets are typically manufactured out of 304-grade stainless steel. We keep these on the shelf as A-Plate and B-Hub configurations with stock bores but can supply custom configurations and bore sizes within a fast lead time. USA Roller Chain and Sprockets can also supply 316-grade stainless steel sprockets for extremely corrosive environments. Idler sprockets are available with a standard ball-bearing pressed into them, with a needle bearing pressed in, or as a bronze-bushed style. Plastic sprockets are manufactured to be light-weight, extremely anti-corrosive, and provide a quieter operation than standard sprockets. 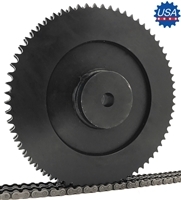 These sprockets are averrable for ANSI sizes #25 - #80 and are typically supplied as UHMW or Nylon material. Finished bore plastic sprockets are supplied with food-grade stainless steel set-screws. Coupler type roller chain sprockets are used for chain coupling assemblies. These sprockets have a slightly flattened tooth profile so they can run within a coupling housing effectively and safely. We stock these sprockets with stock bores, finished bores, taper bushed style, and QD bushed style. Double single sprockets are designed to run two singular strands of a roller chain, hence where the name "double-single" came from. These sprockets are typically stocked as plain hole stock bores, BTB type, ATB type, CTB type, and QT type configurations. It is important to note that when attempting to use a heavy series single strand roller chain you should always check the catalog measurements for the sprocket and chain size to make sure they will work properly together before placing an order.